There's no denying the benefits of a home garden. It provides healthy, organic food that spends mere minutes traveling from plot to plate, ensuring freshness that translates to more nutrients. Furthermore, a home garden means exercise, outdoor time, and savings at the grocery store. But, unfortunately, planting that plot can seem a little like skydiving. Everyone wants to be the kind of person who does it, but when you're faced with the actual prospect, it suddenly seems incredibly daunting. Truth is, they're not at all the same. When you're 12,500 feet in the air, you're either in the plane or out of the plane; there's really no in-between. 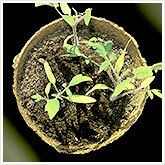 Conversely, a home garden can grow slowly. Even the smallest of gardens - one rosemary plant in a terra-cotta pot - can be vastly rewarding. So find yourself a little dirt and a couple of seeds, and let us show you how to get started. Where to plant your seed? If you're a rural homeowner, finding a little dirt isn't an issue, but we can't all be so lucky. If you don't have access to huge tracts of land, get yourself some pots. 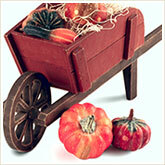 Unless you want to plant something pervasive like melon, most produce will do fine in terra-cotta or plastic confines. If you're not sure, read the instructions on the seed pack or ask the person you buy your seedlings from. If you don't have the space for that, you can always hang a flower box from your sunniest window or your balcony. I live in a tiny apartment in Los Angeles, so I don't grow squash in my backyard (given I don't have one) but between pots and flower boxes, my green thumb gets an excellent workout. Community gardens are also a growing trend. These large, open spaces subdivided into smaller plots for individual gardeners add a great social aspect to your weeding and hoeing experience. It's also an excellent way to learn from more experienced gardeners and to barter fruits and veggies. Grew too many squash this year? I bet that guy with all the tomatoes would be willing to swap a few. Herbs are also a good place to start. Many of them are low maintenance, and unlike fruits and veggies, there's no waiting around for the yield. As soon as your plant is established, you can start clipping leaves. Furthermore, they take up little space, making them ideal for the aforementioned flower box. Many herbs can produce more leaves than you need. The best solution for this happy problem is to pluck those leaves and dry them out in the sun under cheesecloth to prevent pests and wind from getting at them. Start off with perennial plants, or plants that grow for years. Three particularly tough perennials that I always have on hand are mint, oregano, and rosemary. Although they can require watering, I basically ignore them until I want to zing up my pizza or iced tea, then it's just snip and enjoy. 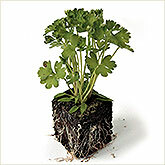 Parsley is a biannual, meaning it produces leaves in its first year and flowers in its second year, and then it dies. But it's very robust and during that first year, you'll have all the parsley you need. Thyme, tarragon, and chives are also easy perennials to try. Once you've mastered perennials, you can try annuals, which only last one season and require a little more care. Basil can be used in scores of recipes. The trick to getting it to last all summer is to pluck off the flower buds every morning. The more you pluck, the harder it'll try to grow and the more leaves you get to put in your pesto. Chamomile works in a similar fashion. Every morning, pluck the flowers and set them aside. For every one you pluck, two more will grow. Dry these flowers under cheesecloth. By the time a well-managed chamomile dies in fall, it will have provided tea for months into the winter. Other good annuals include dill and cilantro. Keep it simple at first. Leafy greens are a great place to start. Like herbs, you can harvest from them all season long. I've had great success with arugula and chard. While tomatoes are supposed to be hardy and fun to grow, I've always found them to be a pain. You need to stake them, and because they're bright red and sweet, they're particularly susceptible to pests like possums. If you don't want to fight that fight, try something just as tough but not as delectable. If you have space, it's hard to miss with any kind of squash or cucumbers. If space is limited, try Japanese eggplant or chili peppers. Considering that Serrano chiles are five times hotter than jalapeÃ±os, rodents don't mess with Serrano chile. Keep in mind that the plants I'm mentioning above are just things I've had success with. Don't be afraid to experiment on your own. I have yet to try growing beans, but I hear good things. If a crop doesn't work, it will cost you little more than a bag of seeds and a little real estate. No big thing. One downside of growing your own food is that, well, a person can only eat so many cucumbers. I make a point of sharing particular large harvests with my neighbors. It's a practice that has made me plenty of friends and resulted in unexpected payback when I needed it most, once as free legal advice and another time in the form of pie. But if you want quicker returns on your crops, look into garden exchanges in your area, where backyard farmers meet to swap produce. A quick Web search for "garden share" or "food share" and your state or city should be enough to find like-minded people in your area. The idea of packing up a summer's worth of produce and heading out to a fruit 'n' veg swap meet may seem a million miles away at this point, so don't rush it. As I said at the start, one pot and a few seeds is all it takes. Once you master that, your green thumb will itch for more and every year your garden will grow a little bigger without your even needing to try. It'll just happen . . . organically.